Property Details: 2 Bedroom, 2 Bathroom Vacation Rental, sleeps up to 8. 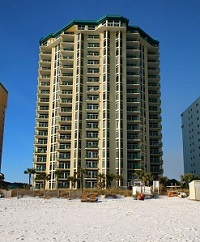 Jade East Towers condo, beach resort home in Destin. The unit is decorated with all new furnishings throughout. The living room, master bedroom and guest bedroom has large, flat screen, smart TVs. There are two DVD players in the unit for those nights you want to stay in and watch your favorite shows, sporting events or movies.The kitchen has upgraded stainless steel appliances, granite countertops and is stocked with all the conveniences of home. I have done my very best to provide everything you could want or need to prepare your favorite meal, frozen drink and coffee. The dining banquette table is attached to the kitchen counter and comfortably seats six. The master bedroom faces the gulf and houses a king-size mattress. You will enjoy a wonderful night's sleep before you head out for your day at the beach. If you choose, have breakfast in bed while enjoying the beautiful views of the beach and gulf from the large floor to ceiling glass windows that look out over the Gulf of Mexico. The guest bedroom has two double firm plush mattresses. There is a full size washer and dryer for your convenience. Jade East condominiums offers all the amenities you could want with a heated outdoor pool with waterfall, hot tub, well-equipped exercise facility, outdoor grills, gated entrance, tennis and basketball courts. Beach chairs and umbrellas are available for daily or weekly rentals from March through October. Jade East Towers Condo Rental in Destin FL. Destin Florida is a Gulf Coast community on the Florida Panhandle located on a peninsula separating the Gulf of Mexico from Choctawhatchee Bay and has subtropical weather. The peninsula was originally a barrier island. Hurricanes and sea level changes gradually connected it to the mainland; however, in the 1940s it technically became an island again with the completion of the Choctawhatchee-West Bay Canal. There are many Destin real estate opportunities for those looking to own a piece of paradise - there a Destin Florida homes for sale from beachfront houses to back-water homes on deep water to weekend cottages.